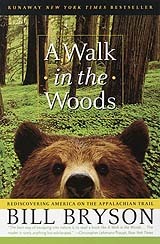 Book review: "A Walk in the Woods: Rediscovering America on the Appalachian Trail"
This review first appeared in the August 8-9, 1998 issue of American Reporter. It didn't take Bill Bryson long to get back into the American swing of things. A native-born Iowa boy, Bryson had nevertheless spent the last 20 years living among our slightly dotty cousins in England. But as he announced a couple years ago in Granta, and then followed up in his last book, "Notes From a Small Island," it was time to come home. No sooner was he back in the nestle of his native land than Bryson decided to hook up with his friend Stephen Katz and take on the uniquely American challenge of hiking the Appalachian Trail. The trail's 2,100 miles snake through wilderness preserves from Georgia to Maine, taking in some of the last remaining forests in North America. Majestic stands of stately oaks, sweeping vistas of verdant valleys ... and some of the funniest scenes from the American countryside since Twain. Because, as always, Bryson is laugh-out-loud, split your sides, Dave Barry kind of funny. He has (quite fortunately for us) retained his distinct knack for getting into weird situations, of meeting odd characters, of having the same kind of goofy things happen to him, famous author, as happen to the rest of us. Her name was Mary Ellen. She was from Florida, and she was, as Katz forever after termed her in a special tone of awe, a piece of work. She talked nonstop, except when she was clearing out her eustachian tubes (which she did frequently) by pinching her nose and blowing out with a series of violent and alarming snorts of a sort that would make a dog leave the sofa and get under a table in the next room. Interspersed with the humor are passages of great passion where Bryson rails against the destruction of the countryside by development. His defense of nature is eloquent and moving  and also provides the necessary leavening to balance the book. The only passages that are flat are when Bryson indulges his prejudices: mocking fat women, white southerners or anyone remotely religious. These few stereotypes fly in the face of the above-mentioned talent for describing folks with a sort of brutal honesty that generally includes their strengths as well as their weaknesses. But, c'mon, if Bryson were perfect he'd be boring  and not very funny. So what if everything doesn't work, if Bryson has a mean streak to him; enough of it does work that your guffaw-to-smirk ratio will still be pretty darn high.